"MISTER H'alebut Cay! Mr. H'alebut Cay!" The page droned the cry down the crowded lounge of the Hotel Splendide and halted before a young man, sprawling on one of the red-leather lounges. "Mister Cay, you're wanted!" 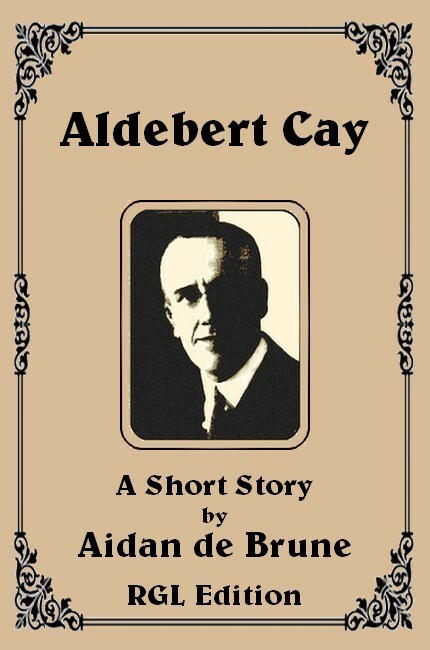 Aldebert Cay managed to struggle to his feet, holding tight to the page's shoulder. Tall, fair and well-built, with the reminder of the country sun's tan on his face, he showed signs of a long spell of drink and dissipation. "Who wan's me? You..." He paused and peered vacantly into the boy's freckled face. "You... you're 'Bob,' ain't you? Though' so. Say Bob, you go an' tell 'em to..."
"Box 4, sir." The page caught the man by the waist of his jacket and propelled him towards the telephone cabinets. "Come on, sir. That's right! Take that in yer 'and an' yell." "Think I don't know?" Cay leaned heavily against the ledge under the instrument, waving the receiver in his hand. "Say, Bob. Take this an' get me a bran'y an' soda. Keep th' change, an' get out. How th' devil you think I'm going ter entertain th' lady when you're there, grinnin' all over yer face?" The page closed the door of the cabinet and went across to the pages' bench against the Inquiry Desk, making no attempt to carry out the order. Drink was not served in the hall lounge of the hotel. The minutes passed. At the end of a quarter of an hour the boy went across to the cabinet. Cay was not there. Puzzled, for he had not lost sight of the cabinet since the young man entered it, he went to the desk and explained to the clerk. Busy, and indifferent, she decided Cay had managed to leave the cabinet while the page's attention was diverted—and placed the note to the young squatter's credit. Matters came to a head next morning when the floor-maid reported that Mr. Aldebert Cay had not slept in his bed the previous night. He had disappeared completely from the hotel. DETECTIVE-SERGEANT Robert Greyson closed his note-book and snapped the elastic band around it. He sat silent, staring expressionlessly at Superintendent Brandon on the other side of the big desk. "He went into the telephone box." Greyson permitted a light smile to part his lips. "From there—nothing." "In a crowded hotel lounge! Talk sense, Sergeant! There's only one solution. He came out of the box while the page was not looking and wandered onto the streets." "He hadn't a hat." The detective spoke stolidly. "His hats, gloves, stick, and overcoats were in his room." "He was drunk!" The Superintendent spoke impatiently. "What of the telephone call?" "The switch-board attendant at the hotel informs me a call from Roytown came for Mr. Aldebert Cay about 2.30 that afternoon. That seems to be the call he went into the cabinet to answer." "The Roytown operator states she had no call for Sydney that day between the hours of 1.10 and 4.21. I've traced both those calls. One to a man in Sussex Street; the other to a lady in North Sydney." "I had a call from the Hon. Samuel Cay, M.L.C., this morning." Greyson spoke woodenly. "He states no one from his house telephoned the Hotel Splendide that day. He added that if you don't have his son located pronto, he'll make a little rebuilding necessary at Police Headquarters." "Humph!" Brandon made a wry face. "Well, Greyson, it's up to you. Am I to tell the Hon. Samuel Cay, M.L.C., that..."
"You may tell Squatter Cay to go where his collective sheep will raise a savoury smell to the heavens!" Greyson levered himself from his chair and sauntered to the door. "Thought I'd let you know how matters stood, in case the Woolly King took it into his head to pay you a visit." THE detective closed the door and walked up the long passage to the main entrance. Greyson was guessing that the puzzle before him would end in a kidnapping case. The Cays were wealthy. Someone had noticed the inebriety and fondness for thrills of the young squatter. It had been easy to tempt him from the hotel—where? He turned on his heels and went down to the Hotel Splendide. Bob Dunn, the pageboy, was not on the bench on the lounge, but sooner or later he would return. For a quarter of an hour Greyson sat patiently watching the people in the lounge and the telephone cabinets. At length, the boy returned, greeting the detective with a shy nod. "Been a run, son?" The officer opened the conversation carelessly yet sympathetically. "Bloke wanted some theatre tickets." The boy grumbled. "Wasn't content to telephone an' pick 'em up at th' theatre." "Still thinkin' of that chap as disappeared?" The boy laughed. "Gee! He could drink! Wish I 'adn't given that note to th' girl. I could do wi' it—an' 'e told me to keep th' change!" "Tell me how he managed to get out of that cabinet without you seeing him and I'll find a pound note for you, perhaps two," Greyson suggested quickly. "Couldn't." The page boy spoke disgustedly. "I was watchin' all th' time. Never took me eyes orf it once." Greyson walked over to the lift and went up to Cay's vacant room. From one of the suitcases he took a number of letters and sat on the edge of the bed to digest them. Three he placed on one side. In the lounge he went to the Desk and asked to be put through to Roytown—to Mr. Sam Cay's station. He went across to his old seat on the pages' bench while waiting for the connection. A few minutes, and Bob Dunn joined him again. "By the way, Bob," said Greyson, "where was Cay going the night he disappeared?" "Prince of Wales," the boy answered promptly. "Takin' Miss Florrie Montgomery ter supper at th' 'Wanderers.'" The girl at the Desk signed to the detective and he went quickly to her. "Number 3 cabinet, Sergeant," she said, in a whisper. "Did I do right?" "Good girl!" He entered the telephone cabinet and lifted the receiver. A female voice answered his inquiry for the squatter. "Mrs. Cay speaking. Mr. Cay only returned home from a long journey half an hour ago and has gone to bed. Can I take a message?" "Please inform him that Superintendent Brandon, of the C.I.B., would like him to come to Sydney, at once." "Oh!" Mrs. Cay's voice tensed with anxiety. "Has... has anything happened to Aldebert?" The Sergeant laughed slightly. "Let me see, there's a train arriving at Sydney about three o'clock tomorrow. Please ask Mr. Cay to be on that train." "Y-e-s." There was doubt in her voice. "You... you are certain Aldebert is all right." "I promise you he shall return to Roytown with Mr. Cay." For a moment the detective hesitated. "That is, provided Mr. Cay comes to Sydney as I suggest." NEXT day, Greyson went into the city and ate a leisurely lunch. Shortly before three o'clock he arrived at Central Station and watched the passengers disembark from the western train. As he expected, Samuel Cay was one of the first to pass the barrier. Sam Cay was detained some minutes before Superintendent Brandon was free to receive him. When he entered the room, he looked inquiringly at the bulky detective seated in the chair before the window. "Well, found my boy?" The squatter, scowling viciously, seated himself in the chair placed before the desk. "Let me introduce Detective-Sergeant Greyson." Brandon spoke quietly. "Where's my boy?" The squatter swung round towards the officer. "Better start at the beginning of the trail." Greyson ignored the squatter and spoke direct to his superior. 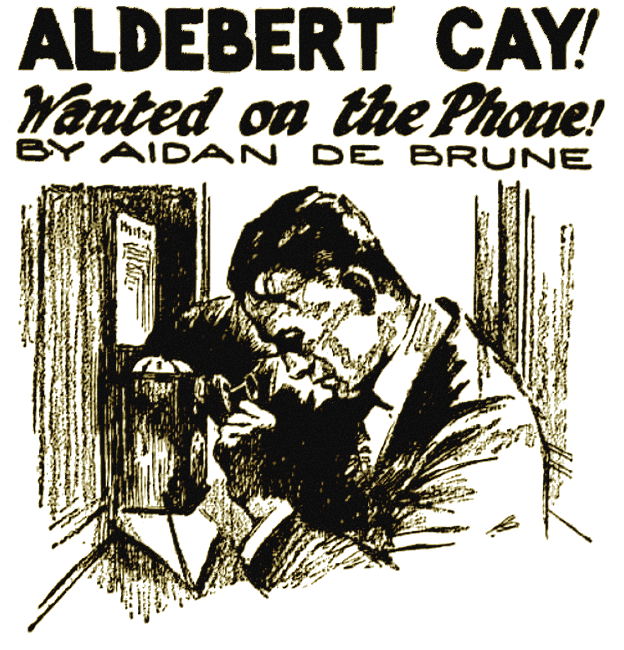 "I was detailed to go to the Hotel Splendide and investigate the peculiar disappearance of Mr. Aldebert Cay. There I was informed a telephone message had come through from Roytown about 3.20 p.m. of the previous day. "I first investigated the telephone call. I found that it did not originate at Roytown; therefore it was logical to presume the call originated in Sydney. I examined the cabinet—in fact, the row of four cabinets in the hotel entrance lounge. I found they were in two pairs, the doors opening opposite each other, in each pair. "It wasn't until I went through the young man's correspondence the second time, I began to understand what had happened. I found he was on very intimate terms with a certain Miss Montgomery." "He wanted to marry her, the damned fool!" interjected the squatter. "And, you objected. I've got your and her letters." The detective turned swiftly on the squatter. "Do you remember an expression you used in one of your letters to your son? You wrote: 'If you don't obey me, I'll put you where you can't do any more harm.' Mr. Samuel Cay, in what inebriate home have you imprisoned your son?" "What!" Superintendent Brandon almost jumped from his chair. One look at the bowed head of the old squatter told the truth of the accusation. "A mystery that, wasn't one!" Greyson laughed drily. "Aldebert Cay never disappeared. Mr. Cay came to Sydney determined to prevent his son's marriage to Miss Montgomery; perhaps to find a cure for his intemperate habits. When he alighted from the train, he telephoned his son and ordered him to come to him immediately. "Young Cay was drunk, but the arrival of his father sobered him somewhat. He promised obedience and started to leave the cabinet. The door was partly open, as also was the door of the next cabinet. Thus, the doors prevented the page from seeing him as he hesitated one step out of the cabinet, and stood in the small angle. "He had remembered his appointment with Miss Montgomery; he went to re-enter the cabinet to telephone her postponing: the appointment, but, half-dazed with the liquor, stepped into cabinet No. 3 by mistake. Just at that time the page comes to cabinet No. 4, and finds it empty. He never thought to look in cabinet No. 3 where young Cay actually was then. Perhaps it was while Bob Dunn was telling his tale to the girl at the desk, Aldebert Cay wandered out of cabinet No. 3, and onto the street to go to his father, forgetting first to go to his room for hat, gloves and stick." "I..." The old squatter stood up quickly, a half-denial on his lips. "Why did you telephone me, Mr. Cay?" Greyson spoke quickly. "Had you not been in Sydney—in fact had you not been to the Hotel Splendide, you would not have known I was on the case. Yet you telephoned the Department asking for me by name." "Didn't have much to go on, Greyson. How did you manage it?" "Mostly bluff." The detective grinned. "There were three points that stood out. First, the doors of the cabinets. Second, old Cay's letters, to his son. Third, his telephone call to me, and..."
"What of the Roytown telephone call?" "Wasn't one. Just a bit of fog on the lines. Old Cay asked at his hotel for the switch operator there to get his son at the Hotel Splendide. He gave his name as 'Cay from Roytown'. That was understood by the switch operator at the Hotel Splendide as 'Cay of Roytown.' The delay on the lines made as if the call was a trunk one. That's all I had to go on, except as I said before..."
"What!" Brandon was smiling now. "Just—bluff. And it came off."